Bostonians love to root for the Red Sox, cheer on the Patriots and heckle the brutalist monstrosity that is City Hall. The hulking hub that houses our mayor and collects all those pesky parking ticket fees has been the source of ire for years. The late Mayor Tom Menino tried to move it to better digs in our own neck of the woods here in the Seaport. Current Mayor Marty Walsh ran on a platform of selling the whole thing to a developer and bulldozing it. In the years since his campaign, there has been a political shift to embrace our ugly duckling, and a request for proposals to transform City Hall Plaza went out to developers. City officials announced yesterday that the owners of the TD Garden had won a three-year contract to redevelop the space into a “winter garden,” beginning later this year. 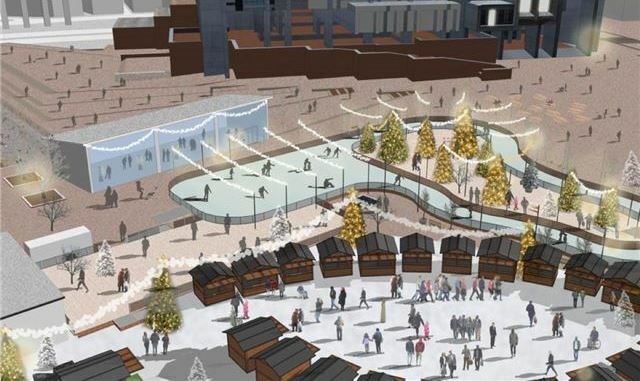 The plan entails upward of 50 “chalets”—vendor stalls—along Cambridge Street as well as a beer garden to form Boston’s version of a European Christmas village. Watch your back, Frog Pond: the remake will also feature an 11,000-square-foot ice skating rink. In keeping with the European theme, Boston Garden Development’s initial proposal included an “iconic” observation wheel a la the London Eye that was noticeably absent from the recent reveal. Developers cite high upfront costs coupled with the subway tunnels underneath the plaza making it structurally unsound as reason to hold off on the mammoth ferris wheel for now. The winter wonderland, scheduled to run from Black Friday until the last week of February, is still a vast improvement over the barren bricks of today. Now please pass the glühwein!